Rikomagic has this week added a new addition to their range of TV sticks, in the form of the newly launched Rikomagic V5 that is powered by Rockchip RK3288 processor and Mali-T764 graphics. The Rockchip RK3288 quad core, 28nm, ARM Cortex-A17,up to 1.8GHz processor is supported by 2GB of RAM and includes either an 8 or 16GB ROM loaded with Android 4.4 KitKat but can be replaced with a Linux operating system, depending on your preference. 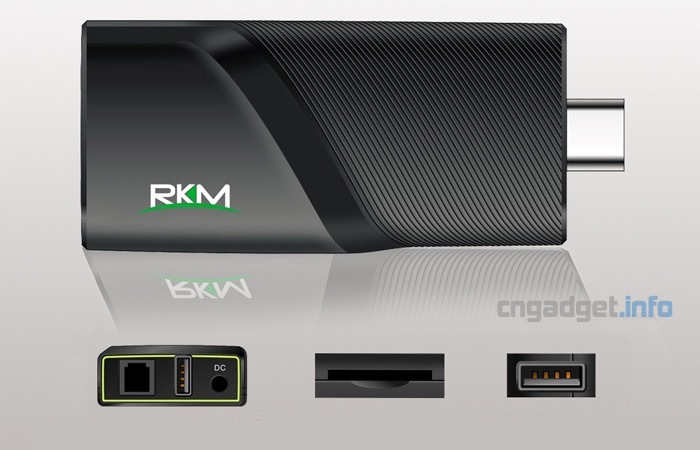 Unfortunately the Rikomagic V5 TV Stick doesn’t come supplied with Google’s Android TV software recently launched. Thats based on the new Android 5.0 mobile operating system and designed specifically for large screen implementations. Other features of the Rikomagic V5 include 2.4GHz/5GHz Dual Band WiFi; 802.11 b/g/n and 802.11 a/c connectivity together with Gigabit RJ45 LAN 100M/1000M Ethernet and Bluetooth 4.0. As well as being equipped with a handy 32GB microSD card slot. The new Rikomagic V5 TV stick is expected to start shipping around November 25th and will be priced at $107, offering connections for HDMI 2.0, USB at either end. For more information on the new Rikomagic V5 TV Stick jump over to the CN Gadget website for details via the link below.